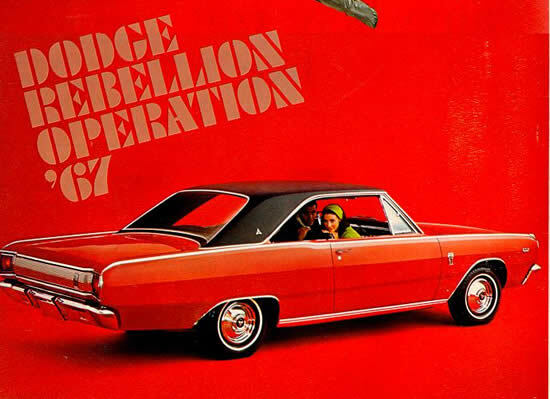 The 1967 Dodge Dart was a completly new car from the previous years. The new Dart was now a bit longer and wider. All new sheet metal and styling followed. The exterior of the Dart featured clean lines and lacked the smooth curves found in the Dodge Charger. The upper scale Dart GT received nicely placed chrome GT emblems and wheel coverings. The optional vinyl roof was a popular option this year. The interior of the Dart was standard fare with the exception of a newly styled dash. It is believed the inspiration for the dash was from the Dart's big brother the Dodge Charger. It featured a wide rectangular speedometer and easy to read gauges. Underneath the skin of the Dart were five optional powerplants ranging from a weak 6cyl all the way up to the very rare 383cid powered Dart GT. For owners who opted for the GT or rallye suspension they received heavy duty shocks, stiffers springs and torsion bars, quicker manual steering, disc brakes (front), and upgraded tires rolling on 14inch rims.